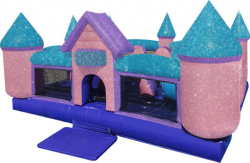 Castle fit for a little queen here in this Toddler unit. Glitter sparkled walls and interactives like the slide and such. 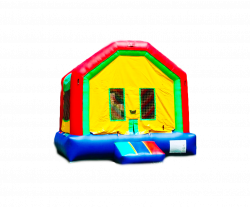 13′ Feet X 13′ Feet Red /Green /Blue /Yellow Bounce House. Perfect those with a small back yard, those with little ones or anyone on a tight budget. 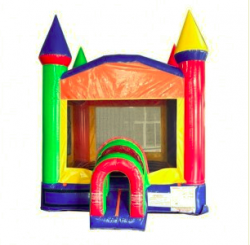 Tiny Yard Series – Tunnel Entrance For Safety – 11′ Feet X 11′ Feet with all the colors Bounce House. Perfect those with a small back yard, those with little ones or anyone on a tight budget. 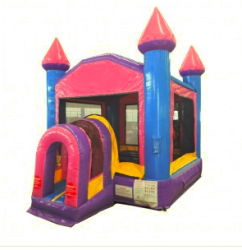 Self Contained Bouncer Playground. 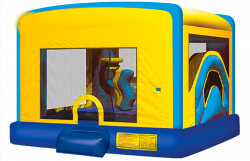 Jump with Interactives, Slide, Play Basketball and play velcro matching games on back wall. Mickey & Gang, Paw Patrol & PJ Mask along w/ Disney Princess Art Panels available as options. The My Little Farm™ educational inflatable structure is designed to educate and entertain toddlers in an adorable farm setting. This game offers a small climb and slide and several 3D animals and structures, such as a dog, horse, chickens, hay stock and a cactus. 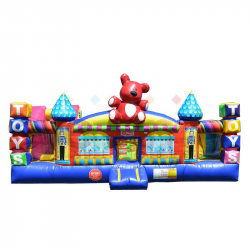 A ball pond is included in this bouncy castle, where kids can learn colors with plastic balls and coordinating baskets for collecting. 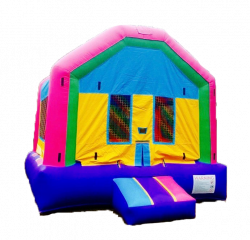 13 Feet X 13 Feet Pink /Purple /Blue /Yellow Bounce House. Perfect those with a smaller back yard than normal, those with little ones or anyone on a tight budget.